We examine principles of good data visualization, including some great and terrible examples, guidelines for human perception, focus on key variables, changes and trends, avoiding chart junk, and more. Data visualization has been a subject of many thousands of books, courses, and blogs. My course on data mining included a one-hour lecture on Data Visualization. However, since you, my reader, don't have an hour to read this blog, here is a KDnuggets-sized summary of what makes a good data visualization from a perspective of a Data Scientist. This excellent map by french engineer Charles Minard effectively tells the story of advance and disastrous retreat of Napoleon army in Russia in 1812. The map shows several key variables: the size of Napoleon army (width of the bar - one mm indicates 10 thousand man), location on a map; temperature (on second scale), direction of travel, and time. There is a ton of research of good data visualization and how people best perceive information - see work by Stephen Few and many others. See 39 studies about human perception, by Washington Post graphics editor for a lot more detail. From Data Science point of view, what makes visualization important is highlighting the key aspects of data - what are the most important variables, what is their relative importance, what are the changes and trends. Data visualization should be visually appealing but not at the expense of loading a chart with unnecessary junk, as shown in the image on the right. with the least ink in the smallest space. There are many examples of misleading data visualizations, also here, and here. One common error(or misleading tactic) is to change the axis to increase the size of effect. Fig. 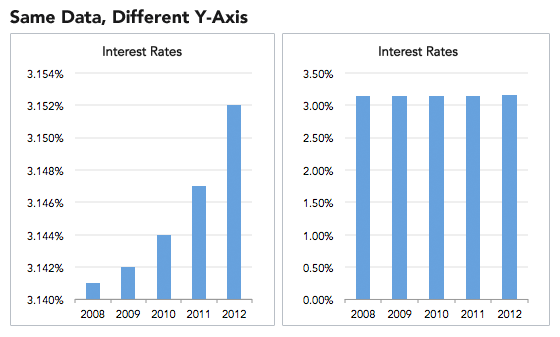 2: Misleading Visualization: Same Data, Different Axis. Ok, so we mention how to avoid making a bad visualization. How do we make a good data visualization? Line Charts to track changes or trends over time and show the relationship between two or more variables. Bar Charts to compare quantities of different categories. Scatter Plots show joint variation of two data items. There are many advanced methods for multidimensional data visualization like parallel coordinates, Chernoff faces, or stick figures, but they have not become popular because they are hard for non-experts to interpret. However, you can go beyond 2 dimensions by also using color, labels, and size to effectively represent additional dimensions. Here is a toy example with US Presidential elections since 1976 (based on this data). Below is an example of how not to visualize this data. First, the percent of popular vote is not the most important variable, since US elections are decided on Electoral college votes, not popular votes. Better chart should show both popular and electoral votes. Second, the scale arbitrarily starts at 40%, unfairly magnifying the differences. Third, in some elections (1980, 1992, 1996, 2000) there were 3rd party candidates that got significant number of votes. A better way to show the competitiveness of an election is to look at the difference between the winner and the 2nd place, in both electoral college and popular votes. Finally, the use of colors for different bars is very distracting and does not convey any useful information. Better use of color is for the party, for example, blue for Democrats, red for Republicans (as is now conventionally used). Here is an improved visualization that shows the difference in electoral college votes between winner and 2nd place (y-axis), difference in % popular vote between winner and second place (X-axis), the size of the popular vote in millions (circle area), winner party (color), and winner name and year (label). Fig. 4: US Presidential Elections, 1976-2016, better visualization. Sometimes the story you want to tell may require a non-standard visualization, even if it requires some manual editing. Good data visualization matters a lot on social media. My most successful post on LinkedIn got over 23,000 views, mostly on the strength of the visualization below (Fig. 5) that compares Gartner Magic Quadrants for Data Science Platforms in 2017 vs 2016. This visualization overlays quadrants for 2 years and uses arrows to show significant movement of firms between the years. Color is used to show positive movement (green), and negative one (red). New entries are shown as green circles, while dropped firms are crossed with red X-s. Fig. 5: Gartner Magic Quadrants for Data Science Platforms compared, 2017 vs 2016. Overall, you see both the current positions in MQ and changes quite clearly. What do you think makes a good data visualization?